How to Reach: Vagator beach can be easily reached from any major city in north Goa or from Panaji by hiring a cab, auto or a bus. One of those few beaches with a naturally mystical look, the Vagator beach does not have to try too hard to attract visitors. It is located in north of Goa in Mapusa district and can be reached easily by hiring a taxi or an auto. Certain buses from Mapusa also come to the Vagator beach. This lovely beach has been the locale of many film shootings in India. The beach looks absolutely ravishing with red laterite cliffs and black lava rocks here and there on the fine white sand. The swaying coconut trees and turquoise blue sea with a ship on the horizon looks like painting moving in front of your eyes. Another dramatic effect to the beach is given by the 500 year old Portuguese fort situated on the beach. The fort provides breath taking view of the sea and the beach and you can click some really stunning pictures from the fort. These factors make the beach truly enjoyable and worth visiting. It is the perfect place to be if you are looking for a romantic holiday with your beloved or a quick getaway with your best friend. The beauty of the beach provides the perfect treat for your soul. The Vagator beach is also famous for the freshwater springs. The tourist inflow at the Vagator beach is quite relaxed thus making it a laid back destination. You can easily let your hair down and be at peace with yourself as you let the magic of unspoilt nature take over you. 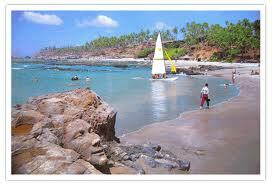 The Vagator is split into two beaches known as north Vagator and mini Vagator beach. These beaches are very popular with mostly British tourists who come here to enjoy the natural beauty of unspoilt surroundings. So come visit the Vagator beach and experience the magic first hand.